Even if it does, what a faith that is not common would have been demonstrated. The term “Christian” was first coined up in Antioch meaning “Christ-like” (Acts 11:25-26). In the present day, the term is commonly and loosely used. It now refers to a section of a society that is born into a religious sect, or have a particular religious orientation and not necessarily someone that practice the ethics of that religion. There is, therefore, a difference or demarcation from those who are nominal Christians and practising Christians. One important criterion that can be used to differentiate both is the faith test. True Christians believe in the life, teachings and deeds of Jesus Christ as Son of God and Saviour of the sinner. There are however Christians today who do not believe that Jesus is the Son of God; and that He came to save the lost. There are those who do not believe part or whole of His teachings. There are also those who believe that such teachings are no longer relevant in our days. There are those who believe that some or whole of Jesus deeds must have been made up, that they must simply be untrue or blown out of proportion. There is another category of people who believe His teachings and deeds but lacked the power to live such lives. The word of God, however, instructs and challenges us to be men and women of faith and not just nominal Christians. Faith is not just believing that God exists; as the devil and demons also believe this (James 2:19). Our faith should go beyond God can do a thing; but that God will do that thing. Again, the time we now live is particularly more challenging for practical Christianity; as science and society are trying to undermine the fundamental features of trust and hope in God. Science disproves the existence of God. Society discourages the reliance on God. There is a shocking question that Jesus asked His disciples before He left 2,000 years ago, it still worries me today. Luke 18:8 – I tell you that he will avenge them speedily. Nevertheless when the Son of man cometh, shall he find faith on the earth? There were people who had lived before us who we can emulate their faith. They were able to receive good report through faith. Some of them even from Jesus Christ. For the three years that Jesus disciples walked with Him, he always referred to them as men of little faith. Surprisingly though, He did refer to someone as a man of great faith. How did this man merit this accolade? Luke 7:1-10 – Now when he had ended all his sayings in the audience of the people, he entered into Capernaum. And a certain centurion’s servant, who was dear unto him, was sick, and ready to die. And when he heard of Jesus, he sent unto him the elders of the Jews, beseeching him that he would come and heal his servant. And when they came to Jesus, they besought him instantly, saying, That he was worthy for whom he should do this: For the loveth our nation, and he hath built us a synagogue. Then Jesus went with them. And when he was now not far from the house, the centurion sent friends to him, saying unto him, Lord, trouble not thyself:for I am not worthy that thou shouldest enter under my roof: Wherefore neither thought I myself worthy to come unto thee:but say in a word, and my servant shall be healed. For I also am a man set under authority, having under me soldiers, and I say unto one, Go, and he goeth; and to another, Come, and he cometh; and to my servant, Do this, and he doeth it. When Jesus heard these things, he marvelled at him, and turned him about, and said unto the people that followed him, I say unto you, I have not found so great faith, no, not in Israel. And they that were sent, returning to the house, found the servant whole that had been sick. – He was very compassionate to people who were not his race. – He loved the Lord God of Israel. – He was very humble. Sent the Jews, not his boys, despite his position, wealth and power. – He saw himself not worthy to get close to Jesus. Not to make Jesus become unclean. Are these attributes we can boast of? How compassionate are we, especially to our host race? How much do we love God? Peter, do you love me more than this? How humble are we? To know a humble person, give them a little power, money or position. If they remained the way they were, then they are humble. Who is higher in worth? You or Jesus. Is Jesus riding on your popularity or you are riding on His? What is the level of your confidence and trust in Jesus? All these will define who you are in the faith. Romans 4:18-22 – Who against hope believed in hope, that he might become the father of many nations, according to that which was spoken, So shall thy seed be. And being not weak in faith, he considered not his own body now dead, when he was about an hundred years old, neither yet the deadness of Sara’s womb: He staggered not at the promise of God through unbelief; but was strong in faith, giving glory to God; And being fully persuaded that, what he had promised, he was able also to perform. And therefore it was imputed to him for righteousness. Though Abraham made certain mistakes in his walk with God from the beginning (Left with relations, Lied, Hagar, Let Ismael live, Not this Eliezer). But when God said at this time of life Isaac would be born, Abraham believed and did not doubt at all. – There is someone here, God says I should tell you to set your record straight. That your problem has been that you are drawn in between two opinions. If Baal is a god, then serve him, but if God is God, He wants your all. Jairus sent for Jesus to heal his daughter. On the way going, Jesus was caught up in the Woman of Issue of blood. People came from home to tell Jairus not to bother Jesus anymore. Jesus, however, told him, “Don’t be afraid, only believe”. Jairus didn’t waver, his daughter came back to life. – There is something precious in your hands now that seems like a baby. Possibly an actual baby. That your baby is coming back to life. – Don’t spread the news around though till that thing has come alive. Help me tell the person beside you “Don’t be afraid, only believe”. Syrophoenician Woman. Her daughter was demon possessed. It’s not something you want to announce around, but she came. The woman was not put off by the insult from the people or from Jesus. There are certain things one cannot get by right/qualification but can receive by grace. She was focused on the expected end. She got what she wanted. – There is something you are hiding, but you know you need help with. Take it to the Lord. Put your faith to work. God will not fail you. – You are you have been told that you do not qualify for something. The God of all grace will grant you favour in Jesus name. – Faith without works is dead – James 2:14-27. Engage in good deeds: towards God, church, outside. – Care for the widows and orphans – James 1:27 – Pure religion and undefiled before God and the Father is this, To visit the fatherless and widows in their affliction, and to keep himself unspotted from the world. – Bridle of one’s tongue – James 1:26 – If any man among you seem to be religious, and bridleth not his tongue, but deceiveth his own heart, this man’s religion is vain. One cannot claim that they are a man or woman of faith if these practical virtues are not evident in their lives. Which one are you doing now? Which one are you left with? Your faith will appreciate if you are able to do them. May God commend your faith. For every child of God, there is a prophet that God has assigned to speak over them. Believing the word of that prophet will grant them favours and vice versa. King Saul did not take the word of Prophet Samuel seriously, he lost his throne. 2 Chronicles 20:20 – And they rose early in the morning, and went forth into the wilderness of Tekoa:and as they went forth, Jehoshaphat stood and said, Hear me, O Judah, and ye inhabitants of Jerusalem; Believe in the Lord your God, so shall ye be established; believe his prophets, so shall ye prosper. If Kings Jehoshaphat didn’t not take the word of that prophet serious, they would have been meat for the three nations that came to attack them. Not that he didn’t say believe the king. But the prophet. – Widow of Zarephath (1 Kings 17:8-16). – Shunammite woman (2 Kings 4:8-17). – Widow of the son of the prophet (2 Kings 4:1-7). If you have been taken the word of your prophet seriously. You will surely profit thereby. – I am re-building you. I am making a new version of you. A lot of people will denounce their faith in the face of death. As believers, however, we must be ready to die for the truth. Jesus is the truth. Often that death does not happen. Even if it does, a faith that is not common would have been demonstrated. – Leah Sharibu (14 years old, huge life ahead of her…). I prophesy to your life, you will not die a commoner. You are a saint now, you will be a saint forever. What kind of man/woman do you really want to be? A man/woman of common faith? A man/woman of a faith that is not common. Go and ask God now. Father, help me to demonstrate great faith. Father, help me to stagger in faith. Father, help me to exhibit a result oriented faith. Father, help me to show forth a pragmatic faith. Father help me to faith in the prophet you have placed over me. Father, help me to die for the truth. Father, let my kind of faith be rare. 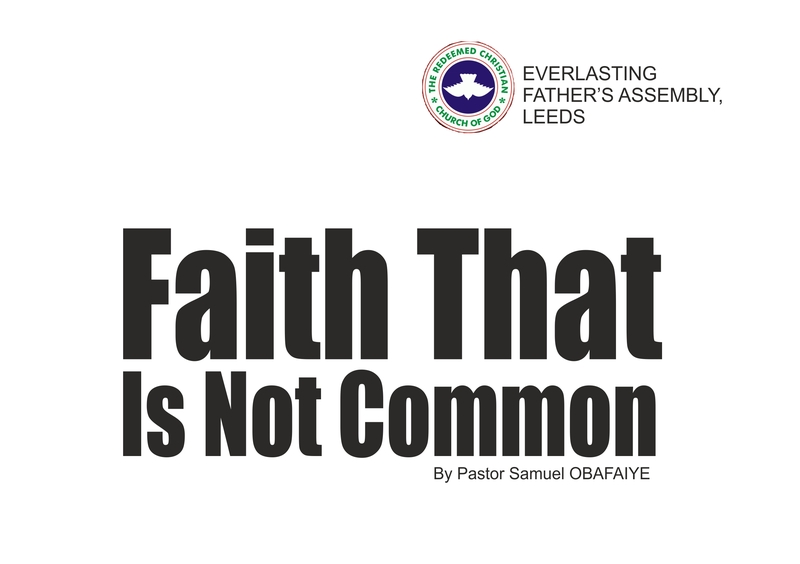 The sermon, Faith That Is Not Common, by Pastor Samuel Obafaiye, was delivered on July 1, 2028.